A couple of weeks ago I gave a talk about PR in China to a journalism class at Beijing Foreign Studies University. In any student talk the Q&A is always the most fun, and this group was no exception. Among the many good questions asked was whether it was easier to do PR in China because, as I had discussed in my talk, the Chinese media is generally cozier with businesses than their Western counterparts. Easier to get stories? Yes. Easier to achieve meaningful results with the public? No. I was reminded of this question by the recent expulsion of hard-charging Al Jazeera English correspondent Melissa Chan, and subsequent closure of the AJE bureau in China after the Ministry of Foreign Affairs refused to accredit another AJE journalist. I didn’t know Melissa well, though I had met her, but I respected her reporting and willingness to insert herself into uncomfortable situations, and I was disappointed to see her go. Reporting on China will be impoverished a bit. That, of course, was the point. The Chinese government has never been comfortable with an adversarial media, and Melissa’s reporting was, like that of much of the foreign press corps, pretty adversarial from their point of view. This discomfort is deeper than cursory annoyance at embarrassing foreign gadflies (although I presume that is part of it). It arises from one of the fundamental philosophies of Leninist political parties: the media are considered Party organs and, as with other Party organs, expected to serve the interests of the Party first and foremost. Media that don’t fit into that model are suspect by definition. You can see this philosophy expressed in the mechanisms of control that the Chinese government maintains over all domestic media, and in the government’s struggles to come to terms with the rise of social media that resist conformity with established power structures. The Party’s model is rather different from the fundamental philosophy of Western media: that it should be the fourth estate, entrusted with challenging the business and government establishment in the interest of the people. You are welcome to argue about how effective Western media have been in this role in recent years, and there are plenty of exceptions, but as a founding principle the idea of the fourth estate is alive and well and inextricably bound up with our Western ideas of what the media should be (and with the value judgments we render on media that doesn’t conform to that principle). A functional, adversarial media is a necessary component of Western-style liberal democracy, unless you have total faith in politicians and institutions. I am not going to comment further on the specifics of the Al Jazeera situation (some links to good articles below), but in light of the Chinese government’s recent struggle with rumors and trust issues, it’s worth reflecting on why an adversarial media is sometimes useful, even to the establishment. This is what I discussed with the students at Beiwai. As a PR practitioner with a company reputation to defend, I’ve experienced firsthand the adversarial media model’s short-term ability to create sleepless nights and great puddles of cubicle sweat. But nevertheless, I still appreciate its value in the long-term. That’s because people are more likely to trust media that challenges me than one they know to be compliant with me, and I need media that the public trusts to get my message out, whether that message is a corporate one, a product review or whatever. If I have to do more work to get coverage in that kind of media, and tolerate some negative coverage as well, so be it. In China, on average, relationships between businesses and the media tend to be closer and less adversarial than in the west. There is also a range of ethical problems, including poor separation of advertising and editorial, the “transportation claim” subsidy-in-disguise, and more. Together, these make it easier for companies to earn –or buy– good coverage in local media than it would be in many other markets. But they also mean that the public is relatively more skeptical of much of the coverage and turns to alternative voices for much of its information and insight, many of them on microblogs . The result is a devalued media that makes even our best earned coverage less useful and influential, and that makes it harder for me to manage misinformation and rumors about my company. These are generalizations. There are excellent journalists and excellent media in China, and crappy ones in the west. But the overall gap in trust is real. The real sign of progress here will not be in the government showing more tolerance for confrontational Western media, but in its tolerating the emergence of a fully independent, professionalized and adversarial Chinese media. That change, when it happens, will be driven by Chinese journalists. In some ways, it’s already happening. For those of us in the establishment, there is value in learning to deal with an adversarial media, and in being good at telling our stories and getting our messages across in media that are willing to challenge us, and that therefore lend credibility to the claims that survive their scrutiny. But if you’ve never had to deal with that kind of media, you haven’t developed the skills necessary to do so, and you rely on a tradition of control and management to get your message across, then you are in the realm of propaganda and will face the consequences in terms of diminished trust. And if your situation is so precarious that there is no way to tell a positive story when engaging with adversarial media? Well, then, your problems are much bigger and deeper than PR skills. Or one uppity journalist. * Just kidding. Naturally, I have no actual dark corners. Note: This post originally published on the defunct group blog Rectified.name. Good news? 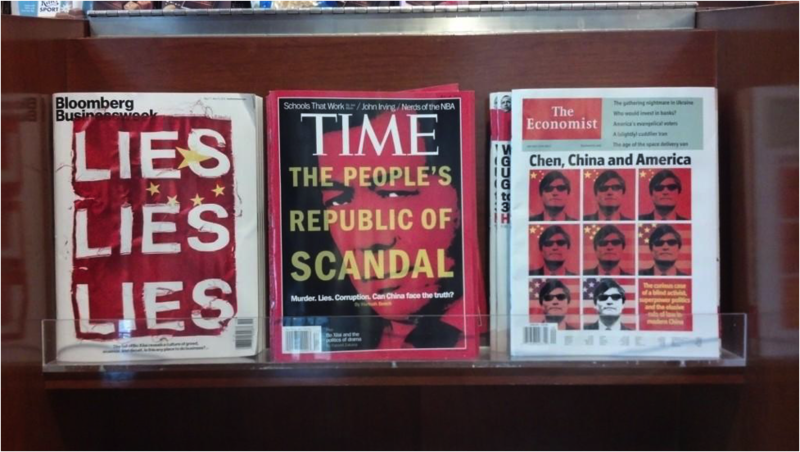 A magazine stand at SFO’s international terminal on Monday. This entry was posted in Uncategorized and tagged Business, Censorship, China, China in the News, Ethics, Journalism, Media, Politics, Public Relations, Rectified.name. Bookmark the permalink.